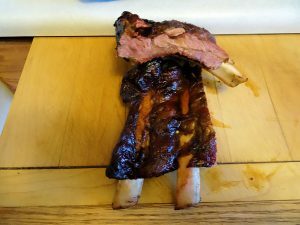 I had some nice meaty beef ribs and was about to do them in a normal 3-2-1 cook when my brain had a spasm. I wanted burnt ends. Why couldn’t finish my ribs like burnt ends? I couldn’t think of a good reason so I did! I cooked these in my WSM Mini. However, you could do them in an oven or with low indirect heat in a barbecue (you need a temperature of no more than 250 F). It is better in a smoker as the smoke improves it. I fired my smoker up to 240 F.
I rubbed the ribs with SPOG (a mixture of salt, pepper, onion powder and garlic powder). I put the ribs on for 3 hours. I took them off and put them in a pan with 125 ml (1/2 cup) beef stock. I put foil over the pan and put them back in the smoker for 2 hours. I took the ribs in and poured the liquid in the pan into a measuring cup. I defatted the liquid by pulling it out from under the fat with a turkey baster. I put 125 ml (1/2 cup) of the liquid into the pan. If you don’t have enough liquid, top it up with beef stock. I added 50 ml (1/4 cup) of barbecue sauce. I used Koss Sauce. It is becoming my favourite sauce for glazing. I put the ribs in the pan and brushed them with the sauce mixture. I put the pan, uncovered, back in the smoker for 1 1/2 hours, turning and brushing twice. When the ribs were darkly glazed, I let them rest for 10 minutes and served. These are wonderful. 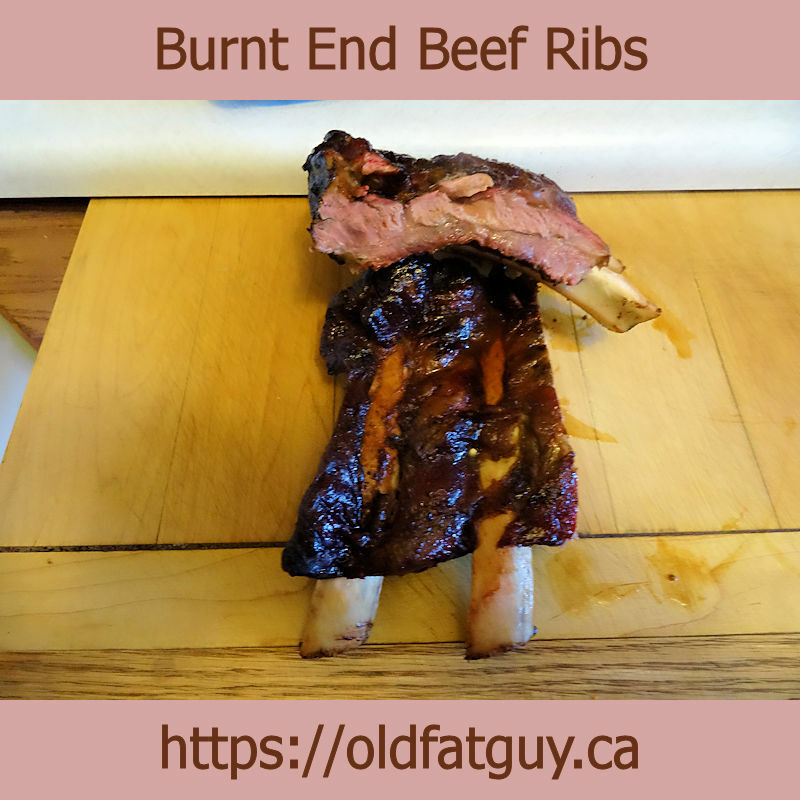 They are my new favourite beef rib! The juicy unctuous ribs with a crust like burnt ends is fantastic. Rich, sweet, beefy. Sigh. I do like my beef ribs. Preheat a smoker to 250 F. You could do this in a 250 F oven or a barbecue over indirect heat but you won't get a smoky flavour. Mix the salt, pepper, onion powder and garlic powder together and sprinkle it over both sides of the ribs. Put the ribs in a small roasting pan. Add the beef stock. Cover the pan with foil and cook for 2 hours. Take the ribs out of the pan and pour the liquid into a clear measuring cup. Defat the liquid by pulling it from under the fat with a turkey baster. If you don't have 125 ml (1/2 cup) of liquid, top it up with beef stock. Put the liquid back in the roasting pan and add the barbecue sauce. Put the ribs in the pan and brush with the sauce mixture. Cook, uncovered for 1 1/2 hours, turning and brushing twice, until the ribs are darkly glazed. Let the ribs sit for 10 minutes and serve.